When author Geraldine McCaughrean accepted her second Carnegie Medal for excellence in writing children’s literature last summer, she took the opportunity to make a statement. She said that the dumbing down of children’s literature is, “wantonly creating an underclass of citizens with a small but functional vocabulary: easy to manipulate and lacking in the means to reason their way out of subjugation.” (You can read the full article here.) While the article mostly discusses vocabulary development, the educator in me can’t help but think of several other reasons why dumbing-down children’s literature might be a problem: children will have a harder time developing higher-level thinking skills (which McCaughrean referred to in her speech), their character will be shaped by Captain Underpants instead of St. George, and the opportunities for developing character through the experiences of heroes and heroines will be lost. All of these are reasons to share classic children’s literature with your children. I once read that if you hold on to spices in your pantry too long, you might as well use pencil shavings in your food. That’s all the flavor that too-old herbs and spices have. This seems like a good analogy for children’s literature: we can offer them the good spices, the classic literature that was written to enhance and flavor life, or we can offer our children pencil shavings: modern literature that is bland, unvaried, and adds very little meaning. There are a lot of things I like about reading classics to my children, but I think they gently refining them like a sharpening iron. Modern children’s books are so carefully filtered that there’s barely any substance. The events are predictable, the characters are one dimensional, and the problems are easily solved. In a Charlotte Mason education, where fairy tales and children’s classics build the literary foundation, filtering ideas and language with a fine-toothed comb aren’t part of the objective. Instead, we teach children how to handle the trials and tormentors, rather than flitting through a land of rainbows and butterflies. From the safety of our laps, our children learn about unhappy endings. Many of the books that are considered beautiful classics often are charged with being “too dark” for children. Fairy tales with endings involving an ax and a wolf; poisonous apples; tales about bunnies who are threatened to be baked in pies; these things tend to make us uncomfortable. I recently read that Americans prefer happy endings in movies. I can think of a few books where the endings were completely changed in the movie so it would all work out nicely. While things end happily in Hollywood, they don’t always end up so perfectly in real-life. Our children will learn this eventually. A book that we love is A Beatrix Potter Treasury . The main characters often disobey, and in turn, suffer major consequences for their actions. This makes some uncomfortable. But, when I read these stories with my children, I can see them processing these outcomes. Their little hearts are empathizing, recalling times when they too have suffered the consequences of their actions. Compare this reaction to another book, a more modern book, that we also enjoy. The little mice and creatures of Brambly Hedge are delightful, and the book is beautifully illustrated. But, instead of encouraging my children to think about something worthy, that our actions have consequences, my children mostly enjoy watching the characters make preparations for a celebration. There is room on our shelves for less in-depth books, but if the bulk of what our children read are surface-scratchers like these, then we are teaching them to focus on the material rather than the character-building ideas that many classic books contain. Last summer, we sped through reading the American Girl series. We enjoyed the tales of brave young ladies, and the stories weren’t watered down at all. But when we started reading A Little Maid series by Alice Curtis, the beautiful language quickly made this classic series a favorite. Even though my daughter, who is five, had questions about some of the words, presenting her with beautiful language was more inspiring than mystifying. Months later, she still repeats phrases from the book. Reading books that contain nail-biting scenes and sometimes heartbreaking themes does not mean I’m disrespecting my children’s innocence. I would rather have them learn about good and evil cuddled up next to me with a book in hand. When we read something that is unpleasant or tragic, we stop and discuss the Christ-centered perspective. We stop and pray. There is so much value in that. Society tells children that good and evil are relative: the standard of truth is constantly changing. But, in fairy tales, it’s very clear what is good and what is evil. This teaches children to cling to what is good, and to hate what is evil. What I DON’T edit out are events that are less-than perfect, or that might spark some deep conversations. It’s true that classic children’s literature isn’t always rainbows and butterflies, but neither is life. Thank you, Beth! I know some people don’t like to substitute words like you and I do, but I truly think the authors of old would understand! Good statement. Another person who had similar thoughts was the poet Ogden Nash, who wrote in the early to mid 1900s many funny poems about how people really are rather than how we think they are, including his poem “Don’t Cry Darling It’s Blood All Right”. 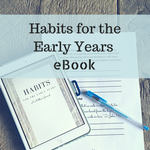 The big list of living books for the early years. What you need for the early years. Send me my book list!